If you own quality leather furniture, you’d do anything to make it last a lifetime. This includes regular cleaning with appropriate leather cleaning products. Did you know that using a poor quality cleaning product can not only reduce the lifespan of your leather furniture, it could potentially harm you as well? Below we’ve listed 5 reasons you should use the correct cleaning products. 1. The wrong cleaning product can destroy your leather! When it comes down to it, a low-quality leather cleaning product will, over time, destroy your leather. As leather is a natural product, it tends to be acidic in nature. Unfortunately, most leather care products are alkaline – the opposite of acidic. This means these types of leather care products cause a chemical reaction when put onto leather. Eventually, this leads to the cleaning product destroying the leather it is supposed to be revitalising! Thus, with a poor quality cleaning product, you will end up with leather furniture that looks old and worn and becomes cracked and dry. To avoid this, be sure to use a high-quality cleaning product that is acidic to match the natural needs of leather furniture. Clean your furniture around once a month to maintain the health of your leather. If you’re not sure which leather cleaning product is right for your furniture, consider calling a leather cleaning expert to come and assist you. It seems like a leather cleaning product should stop mildew and mould from growing, but some can actually make them worse. Poor quality leather cleaner leaves residue behind, creating a breeding ground for fungus. Poor cleaning practice, like rubbing a cleaner into the leather, simply spreads this residue around! This residue, along with other factors like damp spots, can encourage mould and mildew to grow. This unwanted growth can be avoided by using quality leather products that contain ingredients that reduce the growth of mould and mildew. If you think that old remedies like vinegar and rubbing alcohol are perfect for fighting mould on your leather, think again. These products might be great for destroying mildew on your bathroom tiles, but they can do terrible damage to leather, stripping it of its natural oils. It’s also important to ensure the leather cleaning product you are using doesn’t contain strong chemicals. Like vinegar, bleaches and detergents can discolour and even destroy your leather furniture. Along with a quality leather cleaning product, ensure that you clean your leather in an appropriate way. Rubbing can smear cleaning products and even scratch the surface of your leather. Instead dab a sponge softly over your leather, absorbing residue into a soft cloth. Research some leather-friendly cleaning cloths to go with your quality products rather than relying on kitchen sponges or abrasive cleaning wipes. If you have any questions or concerns about your leather cleaning products, always ask a leather furniture specialist or cleaning expert. Many leather furniture owners are unaware that some of their cleaning products are a ticking time bomb. Some of the cleaning products contain a cocktail of chemicals, which are dangerous to use unless you have gloves and masks. In fact, some leather cleaning products are considered environmental hazards and are disposed of using waste containers. Some are even banned from air transportation. If you’re using products like this to clean your leather, do you feel confident enough to sit on that furniture afterwards? Take a look at what’s contained in your leather cleaning products and always opt for non-toxic varieties. Take a look at the product’s ingredients list: a string of numbers that don’t make sense to you is a sure-fire sign of a chemical storm! It’s a regrettable fact that leather can fade over time. Fading can be caused by age, sun exposure or frequent usage. Luckily some leather cleaning products contain dyes which can help to restore the colour to faded leather furniture. This can be a fantastic way to maintain the quality of your leather and keep it looking bright, sleek and new all year round. Take care to ensure you’ve matched the colour appropriately. Consider doing a ‘patch test’ on a part of your leather furniture that’s not easily visible. Use the dye-based product in a small circle and leave it for a few days to be sure it takes full effect. If you’re happy with the colour after this time, go for it! 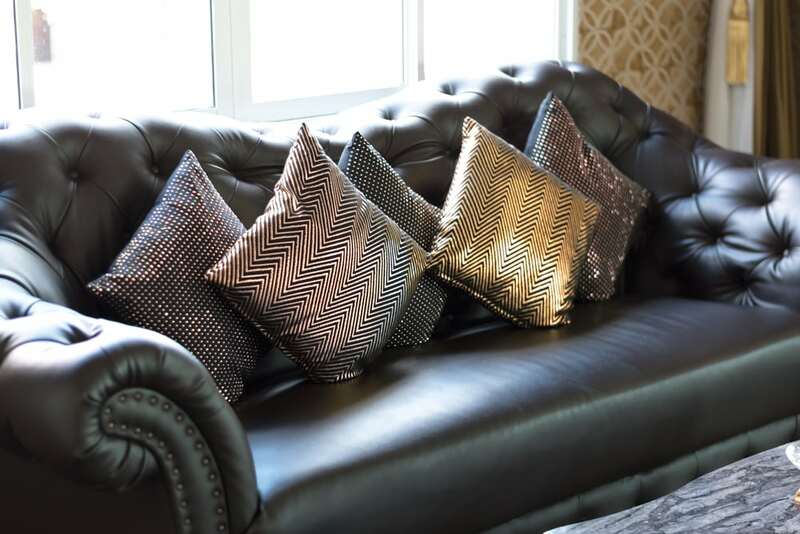 If you choose a leather cleaning product that contains the incorrect dye colour, you’ll end up with discoloured and permanently damaged leather furniture. If you are concerned that you are using the wrong leather cleaner, consider consulting the help of the leather cleaning professionals at Lounge Repair Guys. Not only can we assist in the cleaning process, we can also provide an alternative way to dye your leather furniture. If you have accidently used the wrong cleaning product – don’t panic! We can assist in restoring your furniture back to its original state. That’s correct, some leather cleaning products are potential fire hazards, made of known fire starters like silicone, waxes and petroleum distillates! Petroleum distillates are made from crude oils, so you can imagine how dangerous this could be to have on your leather furniture – especially if your furniture sits near any source of heat, like a fireplace or pot belly. Ensure you use leather cleaning products that don’t contain flammable materials. There are a variety of quality cleaning products that can help – simply ask your professional leather cleaning expert for more information! Leather cleaning products can either nourish and keep your leather furniture looking sleek and stylish, or it can ruin it. To ensure your leather furniture keeps its stunning gloss and colour, be sure to use only high quality, environmentally safe products. Need help or advice about leather cleaning products? Talk to the professionals at Lounge Repair Guys today.